Jewish Home MK, in interview with Arutz Sheva, explains why a deal will never be passed under the current coalition. A US-brokered deal between Israel and the Palestinian Authority (PA) is not in Israel's immediate plans, according to one MK. 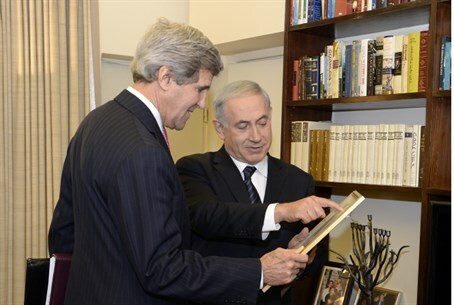 MK Orit Struk (Jewish Home), Head of the Lobby for the Land of Israel in the Knesset, related to Arutz Sheva on Saturday night that the current government will not allow United States Secretary of State John Kerry to dictate terms of a peace deal. The reason: the Referendum Bill - passed in July - which would require a national vote on any deal proposed between Israel and the PA.
Struk was one of the initiators of the bill. "I'm one of three sponsors of this bill, along with caucus chairman MK Yariv Levin, and Chairman of Jewish Home MK Ayelet Shaked," she explained, "and [as such], I must reiterate that a peace deal will not be passed through the government just by a positive referendum vote alone." The MK explained that the referendum vote, necessary to pass a deal, is not the only cog turning the gears of the political system. "To get to a referendum vote, a deal must pass two prior hurdles, the government and the Knesset." "Currently there is no chance that Kerry's agreement will be passed under the current government and I say this based on conversations with ministers. And even if the deal does, G-d forbid, get passed through the current government, the deal would still need to pass through a referendum vote - approved by those same ministers," Struk elaborated. "The primary responsibility [for passing a deal] rests on the doorstep of government ministers and today there is no chance that these ministers would approve such a plan," Struk stated. "And though some would say that the Prime Minister can replace the coalition of the government and create another government that will support the agreement as did [Ariel] Sharon, the Likud members [Prime Minister Binyamin Netanyahu's party] have played a key role in this government, and a coalition change could not occur without their approval," she explained. Struk also reiterated to Arutz Sheva the importance of the organized visit by 15 MKs to the Jordan Valley Thursday, commending them on their dedication to preserving Israel's presence in Judea and Samaria. The MK explained that the visit came at great sacrifice, with some canceling important meetings to attend the ceremony. "There is a very clear statement here that there is no possibility at all for the Prime Minister to adopt Kerry's proposals," Struk stated. "We have a bipartisan wall extending deep into the ruling party preventing a deal. Here is a very clear statement that the Jordan Valley will remain forever under the sovereignty of Israel." Struck also stated explicitly that the Jordan Valley does not come at the expense of the rest of Judea and Samaria. "We objected vehemently to Oslo, as it cut the lands of Israel into pieces and handed them over for terrorism," Struk stated. "There is no chance that Binyamin Netanyahu will bring Israel to Oslo again [. . .] we have made clear that we will not allow parts of our homeland to be divided and given away, and that we will prevent villages from being uprooted anywhere in Israel."